Mr. Xin， a volunteer driver, Mr。 Hu and I went to Gang Kou Elementary School on Monday afternoon (June 3) after visiting Gang Kou middle school students. Although we support 20 poor students at this school, we were only able to interview 5 students at school office and two at their homes due to time contraint--we don't want to take students out during class. So we interview five students between classes and two other students at their homes after school. Wanji He is a 6th grader born in 2000. He lives with his uncle and his mom. His father died of motocycle accident in 2005. His uncle was injured in a separate motocycle accident and still has steel in his leg (lack of money to take it away). After his father died, his mom and his uncle have been lived together to support him. His mom has mental problem and depends on medication to control the mood (partially paid by government). He is very good at Chinese and likes basketball and Ping Pong. He needs to take bus more than 20 minutes to school (each way). He has been sponsored by Mr. Wang Liguo. 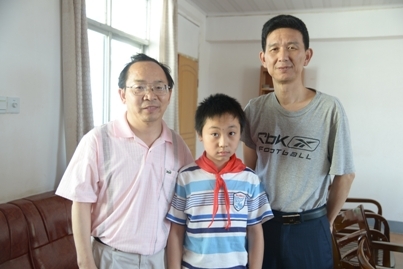 Zijian Zhang is a 5th grader born in 2001. He lives with his grandparents and his mom while his father goes to Gui Zhou Province (very far) to do odd jobs in coal companies--some of them might not be legal. His father has problems with knees. His mom's left eye is almost blind. He likes Math, English, and table tennis. He sometimes walks 30-40 minutes to school to save bus fee. 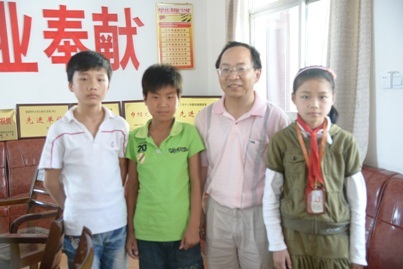 Lei Wang is a 6th grader born in 2001. She lives with her grandma of 68. Her father died of accident when she was around one and her mother remarried and left soon after. She likes writing and dance. She also likes to read books her cousins bought for her. She helps her grandma with chores a little. She has been sponsored by Ping Lin and Shouhong Wang. Zihan Wang is a 5th grader born in 2001. He lives with his parents。 He is handicapped (legs). After much efforts from family and medical treatment, he can walk on his own now although very slowly. I likes his smile. He likes reading and sports. Yes, he does play balls. I was surprised and asked him whether it hurts, he replied no. Pretty amazing to me. His father does odd jobs in a city about 40 miles away and does not come home often. His mom works at a local factory and his grandma sometimes comes to help cooking and taking care of him. His situation needs money to maintain or improve his health. He has been sponsored by Mr. Chuan Wang. Youshu Lv is a 5th grader girl born in 2002. She lives with her grandparents. Her father died of car accident when she was 3 and her mom remarried and left soon after. She has some communication with her mom, which is good for her. She likes Chinese. She helps her grandma with chores. She is very nice kid to talk with and does not seem to be much affected by her situation in terms of openness. Unfortunately the visit photo (taken at school office) is not clear enough to put here. Xibei Wang is a 5th grader girl born in 2001. She lives with her grandparents, her parents, and her younger sister of age 7. Her grandpa is blind. Her father works in Ningguo City while her mother works at a local kindergarten. She lives math and finds it easy, while finds English a little difficult. She helps taking care of her sister and helps her mom a little with chores. It was fun to talk with her. She has been sponsored by Chuan Wang.